Clarice Cliff Pottery; Bizarre Ware, Pine Grove Pattern, 12 Tea Ware Items. 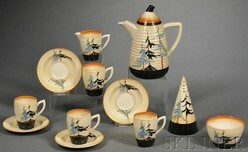 Twelve Clarice Cliff Bizarre Ware Pine Groves pattern tea ware items, England circa 1935; image credit on full record. Twelve Clarice Cliff Bizarre Ware Pine Groves pattern tea ware items. Art Deco pottery, Staffordshire, England, circa 1935.